Read his full biography below. Find KIGO at the end. The great priest Gyooki Bosatsu is well known for his activities at the construction of the Great Buddha of Nara, 奈良の大仏. The "Great Priest" Gyoki was born in Osaka with Korean background and took Buddhist vows at age 15, entering Asukadera in Nara, the oldest temple in Japan founded in 569. Though started as an official priest employed by the government, he was not satisfied with the Buddhism then prevailing in Japan. It was solely for the peace of the state and welfare of the court nobles, not for the masses. He quit the job in 704 at age 36 to propagate Buddhism for salvation of the suffering people and to practice philanthropy, making a pilgrimage mostly in Osaka and Nara areas. Not only did he give a hand to the sick, the poor and many others in distress, he also contributed to social welfare building roads, bridges, irrigation reservoirs and other civil engineering, and helped construct a number of temples. Gradually, he earned fame as a Buddhist and philanthropist. Back at the time, Emperor Shomu (701-756) was reigning Japan and he had a plan to construct a great Buddha statue in Nara. The project was so huge that state funds alone were not enough to cover the total cost. The emperor asked Priest Gyoki to help raise funds. Accepting the emperor's request, Priest Gyoki immediately began fund-raising campaigns. Thanks to his fame and philanthropic activities, enough alms were collected soon afterward, and in 752 casting the Great Buddha statue we see today at Todaiji was completed. Unfortunately, he had passed away just before the consecrating ceremony for the statue took place. Without his self-sacrificing efforts, the colossal statue would not have probably been constructed. In praise of the priest's achievement, the emperor conferred on him the title of Dai-sojo, or the Great Priest, the highest rank given to priests. In addition, people called him 'Gyoki Bodhisattva'. The priest had two honorable titles: the official Dai-sojo and unofficial Gyoki Bodhisattva. Priest Gyoki is also reported to have helped build Sugimoto-dera in Kamakura, although evidence suggests otherwise. and so went to Nara in 736. One of these monks, Bodhisena (Japanese Bodaisenna), succeeded Gyoki as director of the Buddhist community of the Todai-ji (Nara) in 751 or 752. In turn, another monk named Ennin traveled to China to Mount Wutai in the year 840, during a journey that lasted nine years from 838 to 847, and brought back scriptures and images of this Bodhisattva. was an Indian Buddhist scholar and monk, known for traveling to Japan and establishing the Kegon school, the Japanese transmission of the Huayan school of Chinese Buddhism. His stay has been noted in the official history records called the Shoku Nihongi, where he is referred to as Bodai-Senna. Bodhisena got mystical inspiration from Manjusri Bodhisattva. He initially went to China, having heard that he could meet the incarnation of Manjusri at Mount Wutai. However, on reaching Mount Wutai, he was told the incarnation was in Japan. He also became acquainted with the tenth Japanese ambassador to China, Tajihi no Mabito Hironari. He also met the Japanese monk Rikyo. On the invitation of Emperor Shōmu, he visited Japan to spread the use of Sanskrit and establish Huayan Buddhism in the country. He traveled with the Japanese delegation of Tajihi no Hironari, via Cambodia and Champa in Vietnam. On the same ship were other important historical figures. They included the traveling companions Genbō and Kibi no Makibi. Genbo was a monk and was returning from China with the over 5,000 fascicles that made up the Chinese Buddhist Canon. Kibi brought with him the arts of embroidery, playing the lyre, and the game of Go. Kibi is also said to have invented katakana, whose Sanskrit influence is attributed to Bodhisena. The Man'yōshū contains a poem by Kibi about a crow that fed on rice grown by a Brahmin. The famous Chinese Buddhist monk Dōsen (道璿, Chinese Daoxuan, 702–760) greeted him upon arrival. Accompanying Bodhisena was a Cambodian priest and musician called Fo-t'ieh in Chinese (also known as Buttetsu and Fat-triet). He later resided at Daian-ji with Bodhisena, and wrote a work on the Sanskrit alphabet. He also composed religious dances representing subjects taken from Indian mythology, which came to be known as Rin'yu-gaku or Champa dances. These dances were still extant in the early 20th century. The party arrived at Naniwa (Osaka) in August 736 and was met by the monk Gyoki. According to a number of sources, Gyoki and Bodhisena recognised each other from a past life. ... Bodhisena resided in Daian-ji (大安寺) in Heijō-kyō for the rest of his life. 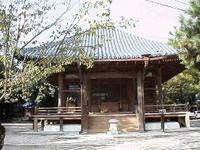 He died on February 25, 760 at Daian-ji temple, and was buried on the Ryoujusen (霊鷲山) mountain, following his wish when he died. The temple's grounds contain a hackberry nettle tree more than 800 years old. The tree was said to be a manifestation of god, and a temple was built in its honor. The number of worshippers increased sharply every year, and the temple was officially established as a religious body in April 1952. The following year, a new hall of worship and shrine office was built. Horakuji is situated within the grounds of the Kuwazu Cemetery, which originated with the sage Gyoki Bosatsu; the grounds are slightly elevated and are thought to be the remains of an ancient burial mound. The temple had been established on 1084, there are four principle statues in this temple. One of this, Jizo-Bosatsu, made by Gyoki-Bosatsu, is known to us as "Yakuyoke Jizo", the literally means, to avoid devil. It is allowed to disclosed only once of 33 years and the last opened year was April 1987. Now, apprix. 1500 kinds of cactus are growing up in the site, therefore, this temple is sometimes called, "cactus temple". Daizenji Temple 大善寺 in Yamanashi prefecture possesses a one-of-a-kind seated image of Yakushi holding grapes in his left hand. Yamanashi is a grape-growing, winemaking region, and Budō Yakushi ブドウ薬師 (Grape Yakushi) is befittingly the protective deity of local grape farmers. Daizenji’s Yakushi Hall is a designated national treasure (dated to 1286). The temple claims its Budō Yakushi icon dates from the Heian era. For reasons unknown (to me), Yui Suzuki does not mention this temple or this statue in her book, but she does make passing note (p. 42) of an intertwined grapevine motif on the mandorla of the ninth-century Yakushi statue at Shōjōji Temple (Fukushima) – a motif she says is also found on the eight-century pedestal of the famous bronze Yakushi statue at Yakushiji Temple in Nara. This is a special statue of Yakushi Nyorai, the Buddha of Medicine and Healing, in the wine-growing prefecture of Yamanashi (Japan), Katsunuma City 勝沼. During the Nara period, the famous Monk Gyoki 行基 visited the area and had a special dream about this deity one night. Yakushi was holding a bunch of grapes in his right hand, and in the other his usual medicine bottle. When he woke up, Gyoki started to carve the statue he had envisioned in his dream, and went on to found Daizen-ji Temple 大善寺 (designated a National Treasure), were the statue is still installed. It is the only statue of Yakushi holding grapes in Japan. In olden times, wine was one of the precious medicines of the day. Yakushi has since become the protector deity of the grape-growing farmers in this area. This is also the oldest part of Japan where real grapes, not wild mountain grapes, are grown. They make a drink called Budō Shu 葡萄酒, a bit different from wine, made like Japanese sake. But latest research shows that the grapes of this area originate in the Caucasus area and might have reached Japan via the Silk Road and Buddhism. Or maybe migratory birds dropped the seeds??? This statue by Gyoki is said to look like Gensho Tenno.
. Empress Gensho Tenno 元正天皇 . Two of the most well known priests associated with hot spring bathing were Gyooki-Bosatsu and Kooboo-Daishi (Hotta, p.20). 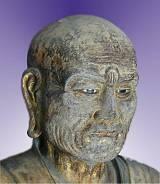 Gyooki (668-749), a Buddhist monk, was director of construction of the Great Buddha at Nara's Todai-ji temple. It is believed he brought out healing hot water from rocks throughout Japan (Grilli, p. 110). Todai-ji-Nigatsu-do (the February subtemple) is the religious building built over the main spring that supplied the temple with water. The priests performed omizutori, a ceremony for cleansing the Buddhists with water. It also served as a bathhouse for monks. (Grilli, p. 52). Kooboo Daishi (774-835), it is said, was also able to bring forth water from rocks. Seeing sick and dying beggars, legend says he would strike a rock and healing water would rush out (Grilli, p. 110). As for Shibu onsen has been told to have discovered by the Gyoki-bosatsu at the Nara period. Sep 10,1561 The battle of Kawanakajima had occored and Shibu onsen were the grounds for medical treatment of many soldiers who've got damaged. At that era, Ichizaemon, the first master of Kokuya, who had handled rice store,taking advantage of this opportunity, opened a travelers hotel,and it has resulted soon, obtaining a visitor's patronage since then. It is the 16th generation in this present Master. Many years ago Gyoki Bosatsu (a Buddhist priest) was training himself around Japan. Since then this clear water is called“Shichimi Clear Water.”And people in town enjoy drinking through many years. Read about a statue made by Gyoki at Nozaki. For more than a thousand years, the Japanese Buddhist priest Gyōki has been well known for his seventh-century charitable religious activities. His biographies and hagiographies tell that not long after the “official introduction” of Buddhism into Japan, Gyōki roamed the countryside propagating the teachings together with farming techniques to oppressed people hungry for both. His activities, in defiance of secular law, were carried out in a time when the government maintained strict control of Buddhists by confining them to temple grounds for academic study. With supporters outside the capital swelling to thousands, an imperial edit was issued against his actions and Gyōki was arrested. This tactic backfired as a government attempt to quail the growth of Gyōki's hero status among the non-aristocratic population. As a result the government reversed it's stance toward Gyōki and he was awarded the rank of High Priest (Daisōjō). 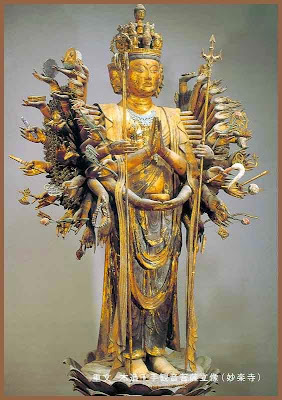 Meanwhile, among the masses he became known as the Bodhisattva Gyōki (Gyōki Bosatsu). Subsequently, he became the first person in Japan to be awarded the title Bodhisattva by the government as an official rank. Throughout Japanese history, Gyōki reappears in literature as an archetype of both a man of the people and as a shaman-priest. The most famous of Haiku poets, Matsuo Bashō, wrote of Gyōki in his seminal work Narrow Road to the Deep North. The Chinese graph for chestnut consists of west and tree and is, therefore, linked up with the Western Paradise of Amitābha (J. Amida). This is why the Bodhisattva Gyōki all throughout his lifetime used the wood of this tree both for his walking stick and for the pillar supports of his house. These qualities may explain his popularity and even the worship of him in the Kamakura period, over five hundred years after his death when such an image would be revered. Yet, from biographical and physical evidence dated earlier, researchers now question at least the latter two components of his popular image, if stopping short of the more radical suggestion that his entire biography could have been fabricated. Nevertheless, if Gyōki’s faith in the saving powers of Amida was grossly exaggerated and if his life was not a blend of shamanism and Buddhism, the emerging portrait of him as propagator of an earlier or 'more pure' form of Buddhism is even more appealing to a modern audience. The early national histories of Japan clearly indicate the government’s position on Buddhism at the time Gyōki lived was that it offered to their disposal a magical potential that could be harnessed for economic, political and healing powers. Writings such as the Nihon Shōgi and Shoku Nihongi leave little room for doubt that this accounts for the official interest in Buddhism and controlled support of its study and practice. Nevertheless, besides being perceived as an uncontrolled spiritual power, Gyōki may have been imagined to present, his arrest was likely related to reports of huge gatherings of rural people he was organizing. This was seen as an imminent political threat to the instable power of the capital. Gyōki’s reported behavior centers on building hostels, opening farm lands, constructing irrigation systems and other charitable activities aimed at improving life for a large number of people. This emphasis does not tell of a tendency to rely on magic or the saving power of another (tariki  ) as seen after Gyōki’s time in the esoteric Buddhist movements of the Heian period and the Pure Land traditions become immensely popular afterwards. For this and other reasons, researchers have suggested the possibility that the Buddhism Gyōki propagated may instead be seen to represent a tendency toward rejection of the notion of magic Buddhism embraced by the government, as well as their scholastic studies. In addition, Gyōki’s Buddhist master was master Dōkyō, who first propagated the Hossō (Sanskrit: Yogācāra) tradition in Japan. Many aspects of Gyōki’s charitable projects are easily understood in light of the content of Yogācāra texts that Dōkyō is known to have imported from China and taught in Japan. Viewed in this way, Gyōki’s was a mass movement against the government's insistence on magic and scholastic study by Buddhists. Instead, like the historical Buddha Shakyamuni, Gyōki emphasized Buddhist practice, stressing charity work. Saichō, the famous Heian period founder of the Japanese Tendai Buddhist tradition, praises Gyōki for these very qualities and seeks to emulate his lifestyle. Gyōki’s place in the history of Japanese Buddhism has been insured for centuries by hagiographies and literary works disseminating the image Bashō upholds. If, however, recent scholars are correct in assessing the nature of his form of Buddhism, Gyōki’s role in the history of Japanese Buddhism has not only been mistakenly categorized but also likely underestimated. Regardless, a fabricated image persisting in various usages a thousand years is no less influential. It is the task of the present study to familiarize the reader with portraits of Gyōki's life. Because of the importance of legions about Gyōki for both the history of Japanese Buddhism and that to Japan in general, while this study points to modern scholarship and sometimes interprets Gyōki’s actions for a Yogācāra perspective, it also introduces the most influential legends of Gyōki. In order to better explain the activities of his life these are framed within the context of Japanese history and the history of Japanese Buddhism. To contrast Buddhist traditions, the historian Gyōnen used the classifications jiriki (salvation by means of one’s own efforts) and tariki (reliance on the powers of another for salvation). According to the argument above, Gyōki’s Buddhism should be classified as jiriki in contrast to the tariki of Pure Land Buddhism. ..... According to the modern calendar on April 2 - 3. In the old lunar calendar, it was the second day of the second month, February. 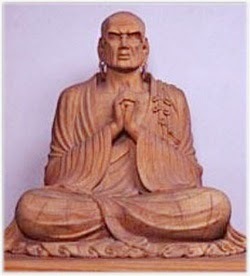 Gyooki founded this tempel and made the statue of the healing Buddha, Yakushi Nyorai, by himself. This is an intangible cultural asset of Japan. It dates back to about 730, when Gyoki with the help of the 16 Doji 十六童子 child attendants encountered an old man with white hair at the Kannon waterfall 観音出現の滝. Gyoki and the 16 attendants pounded rice for mochi as an offering for the deity. The festival takes place on the 2nd and 3rd day of the first lunar month, now sometimes on a sunday in February. The mochi are pounded by the young menfolk of the nearby village. Two groups each of 8 men pound the rice, 8 men lift and lower the mallet and sing special prayer songs. 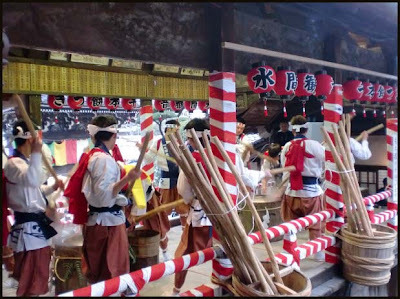 They are arranged along the main hall to pound with 1000 long sticks and mallets. The monk Gyoki founded and rebuilt the Arima Hot Springs. Gyoki whom the Emperor Shomu (701 – 756) trusted deeply was a high monk who dedicated himself to building ponds and bridges, digging ditches and enshrined temples. and legende relating to Gyoki in Arima.
. 要仲山玉龍寺 Temple Gyokuryu-Ji . in Gifu. Founded by Gyoki Bosatsu. as always, my deepest thanks to Gabi sama... whose pulse is go-shichi-go and whose heart is kigo. Written at a kasen composition in Sukagawa 須賀川, with priest Kashin 僧侶可伸. Basho praises the simple life of this holy man in his greeting hokku. The Chinese character for kuri 栗 consists of the parts for West 西　above a Tree　木. It reminds us of the four Buddhist paradises in the four directions. Like Saint Gyoki Bosatsu, who used a walking stick of the wood of this tree and had the pillars of his hut made of it. Could it be my father? Could it be my mother? founded by . Gyōki 行基菩薩 Gyoki Bosatsu . The head temple for the Shingon sect, it is said to have been founded in the year 725 by the Buddhist saint Gyoki. Osshinji 乙津寺 Osshin-Ji - Umedera　梅寺 "Plum Blossom Temple"
. Kiyotakiji 清瀧寺 / 清滝寺 Kiyotaki-Ji . Nr. 35 of the Shikoku Henro Pilgrimage 四国八十八ヶ所. The temple has been founded by Gyoki Bosatsu in 718/719. 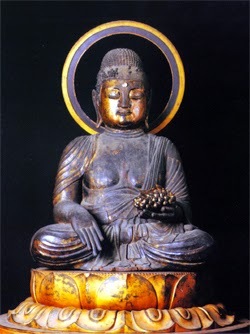 The main statue of 十一面観世音菩薩 Juichimen Kannon Bosatsu is said to look like Gensho Tenno. It has a special head with 24 faces ２４面 and 1000 arms carved from one piece of wood. It has long been a secret statue for very long, but has now been restored and is shown to the public. When you walk along the Rows of Pine Trees at Maisaka, you will find the statue of a young boy called Namikozo. According to the folklore in Enshu region, Namikozo is a yokai (goblin) who has the power to tell the weather by the sound of the waves. The legend has it that namikozo originated from one of the two straw dolls produced from the harvested rice. Priest Gyoki (highly respected priest during mid 8th century) chanted the sutra and told the dolls to help the farmers to forewarn the storms and threw them into the river. Years later one of the dolls turned into the goblin and was caught by the fishnet of the fishermen. The goblin asked the fishermen to let him go and he will use his magic so that the fishermen know how the weather will be like by the sounds of the waves and fishermen released him. Since then, when the roaring of the wave comes from the southeast it tells the sign of rain, from the southwest the sign of fine weather. Namikozo is often picked as one of the seven wonders of Enshu Province. Yonako Takizan Fudo-Ji in Suzuka, Nagano. 台東区谷中6-2-35 / 6 Chome-2-35 Yanaka, Taitō ward Tokyo. The main statue is senju Kannon 千手観音 Kannon with 1000 arms. In 1573, Yakushi Nyorai appeared in a dream of the priest 宗音公和尚 and asked him to built a temple. The Kannon statue is said to be made by 行基 Gyoki, who was walking all around Japan at this time. At the pond 昆陽池 Koya-Ike there are many fish with only one eye. Once upon a time, 行基上人 Saint Gyoki Bosatsu found a man lying by the roadside and wanted to bring him to 有馬温泉 Arima Hot Spring. But the man could not move and only murmured he wanted to eat some fresh fish. When Gyoki found a fish and offered him to eat it, the man said, Gyoki should eat first. So Gyoki ate half of the fish, including one eye. Now the man said he had black pocks all over his body and wanted Gyoki to lik them. When Goyki started to lik his skin, the man suddenly changed and stood there as Yakushi Nyorai. He had only tried the purity of Saint Gyoki. The fish was thrown into the pond, but now he had only one eye. Koyaike is now a place name in Itami, where there is a park, 昆陽池公園.
. Uejima Onitsura 上島鬼貫 (1660-1738) .